It was an extremely bullish month for world equity markets, with net monthly gains ranging from 12.3% (Germany), 8.5% (USA - Dow), to 1.8% (Brazil). Notably, the US market managed an important close back above the 10MA, other world markets look set to follow into year end. 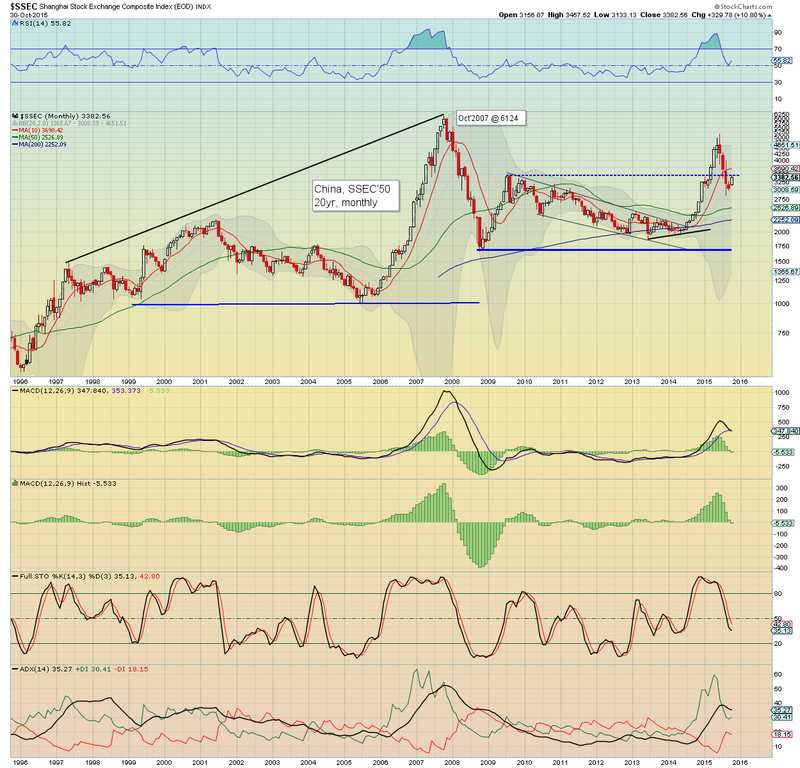 The third consecutive net monthly gain, with the Athex settling +7.2% @ 702. Next upside resistance is not until the 900/1000 zone... and that is around 30% higher. 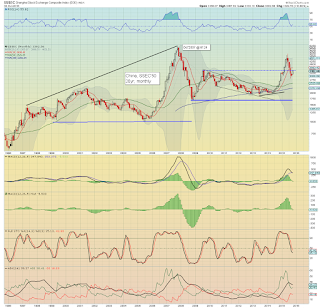 With commodity prices remaining weak, the Bovespa continued to struggle, with a relatively minor net monthly gain of 1.8% @ 45868. 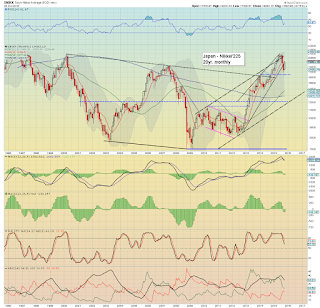 The Oct' candle is somewhat spiky, and a break back to the 43/42000s looks probable. 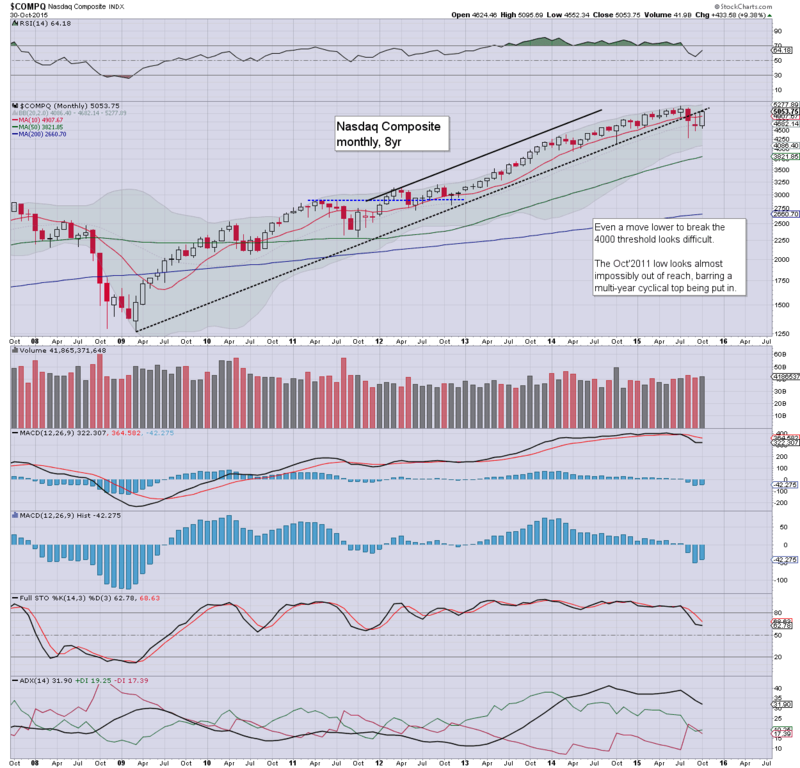 A powerful net monthly gain of 9.9%, with the CAC back on a charge for the 5000s. 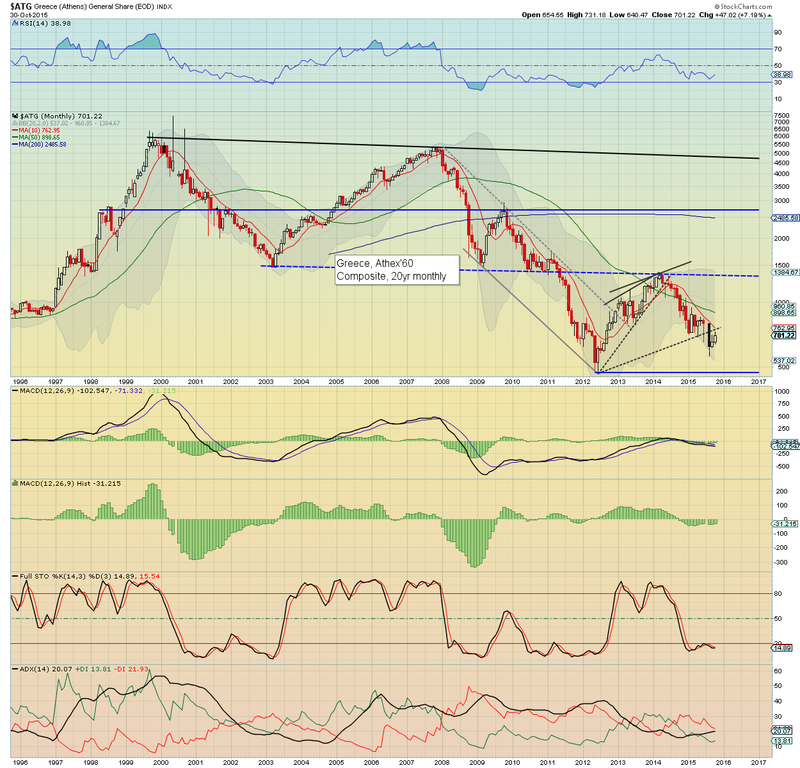 There is key declining resistance in the 5100s. 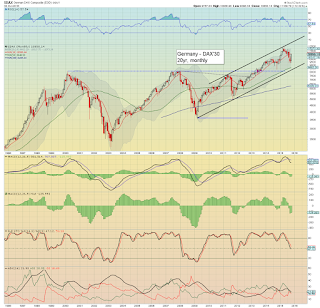 The economic powerhouse of the EU - Germany, saw a hyper powerful monthly gain of 12.3%, with the DAX close to re-taking the key 10MA (10995). 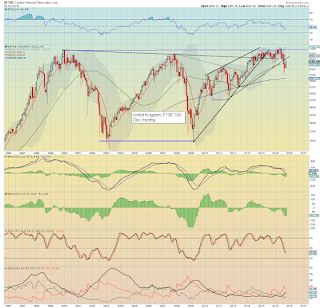 A year end close in the 12000/12500 zone looks probable. Relative to most other world markets, the UK is still struggling, with a net monthly gain of only 4.9%. The 10MA in the 6600s will be a real challenge for the FTSE to break above... but it does look due. After that... it will be back to a case of whether the UK can break and hold the 7K threshold in spring 2016. 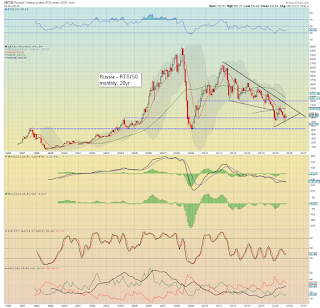 The ugliest of the EU-PIIGS - Spain, saw a net monthly gain of 8.4%, with the IBEX back in the 10000s. Key resistance remains the 12K threshold. 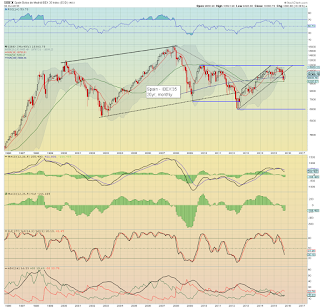 A break above 12K will open up a hyper-bullish move to challenge the Nov'2007 high of 16040. 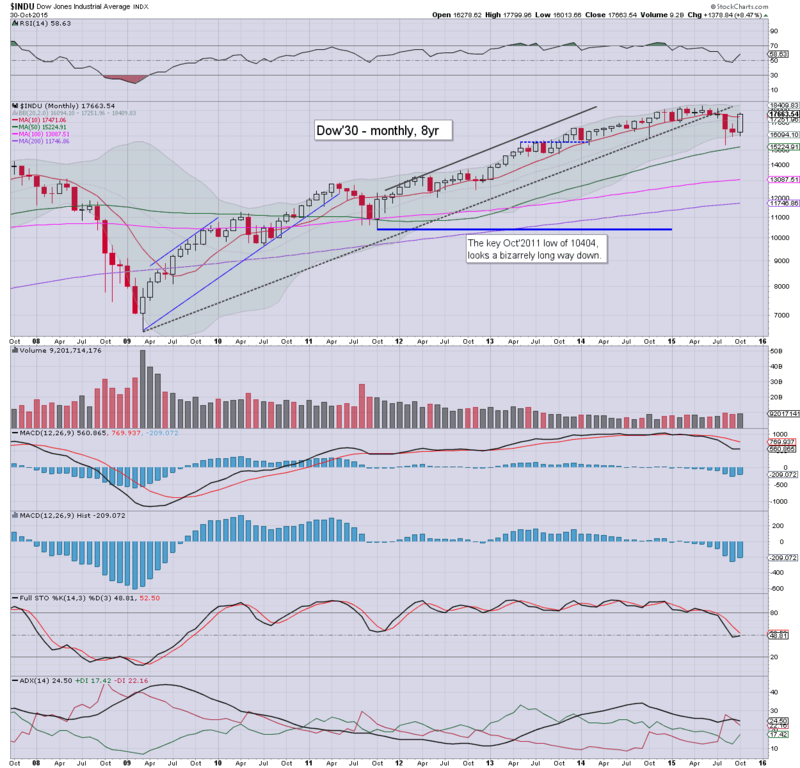 The mighty Dow saw a net monthly gain of 8.5%, settling the month @ 17663. A retrace to the 17K threshold would be very natural in the first half of November, before resuming higher. 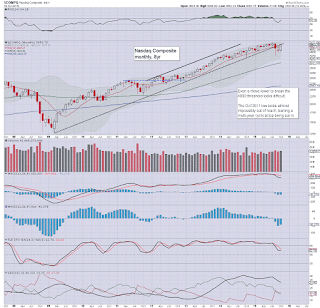 A year end close >18K looks probable. Underlying MACD (green bar histogram) cycle remained negative for an 8th month, but is starting to tick higher. At the current rate, it will take at least until January to see a bullish cross. It would seem the May high of 18351 will be broken above within the next 2-3 months... after that.. next resistance is arguably not until the giant psy' level of 20K.. which would likely no earlier than April/May 2016. 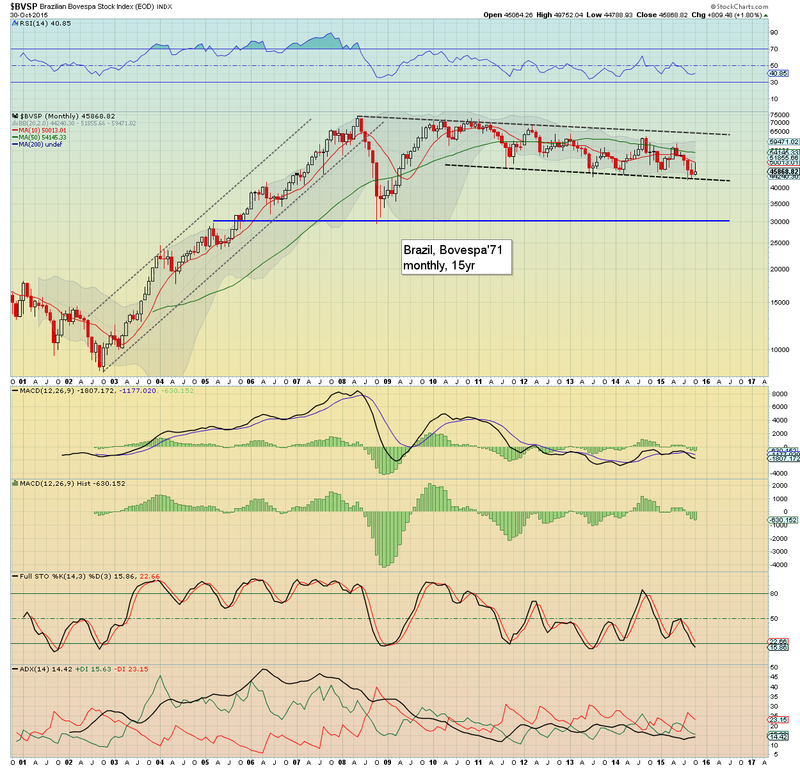 The BoJ fuelled Nikkei saw a powerful net monthly gain of 9.7%.. back in the 19000s. 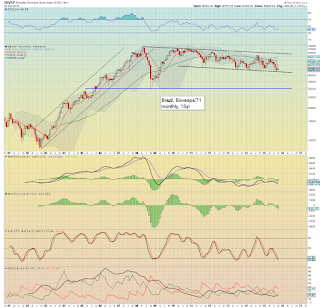 A year end close >20K looks highly probable. 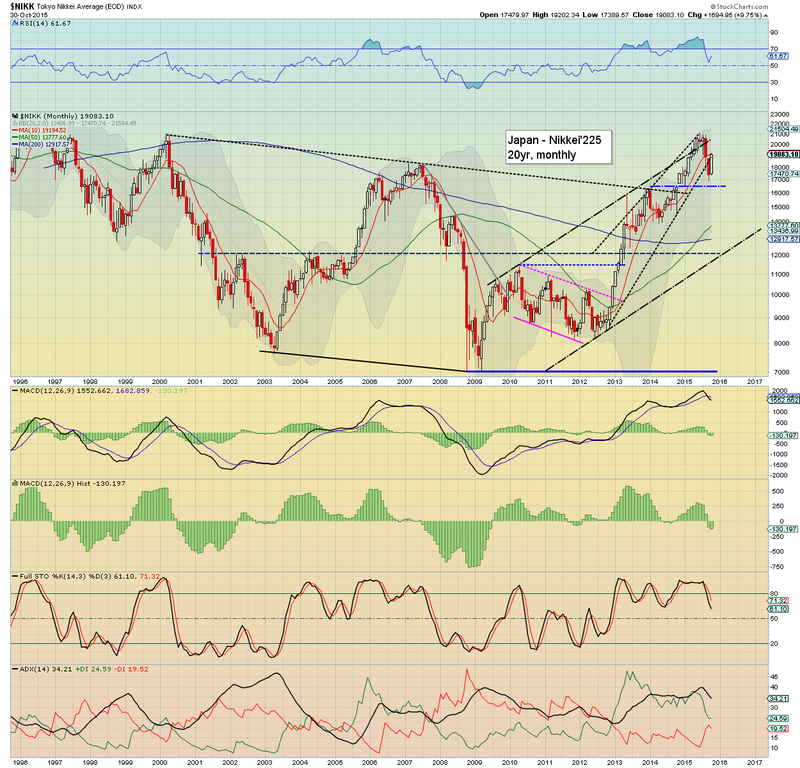 By late spring 2016, the Nikkei could be trading around 23/24K. 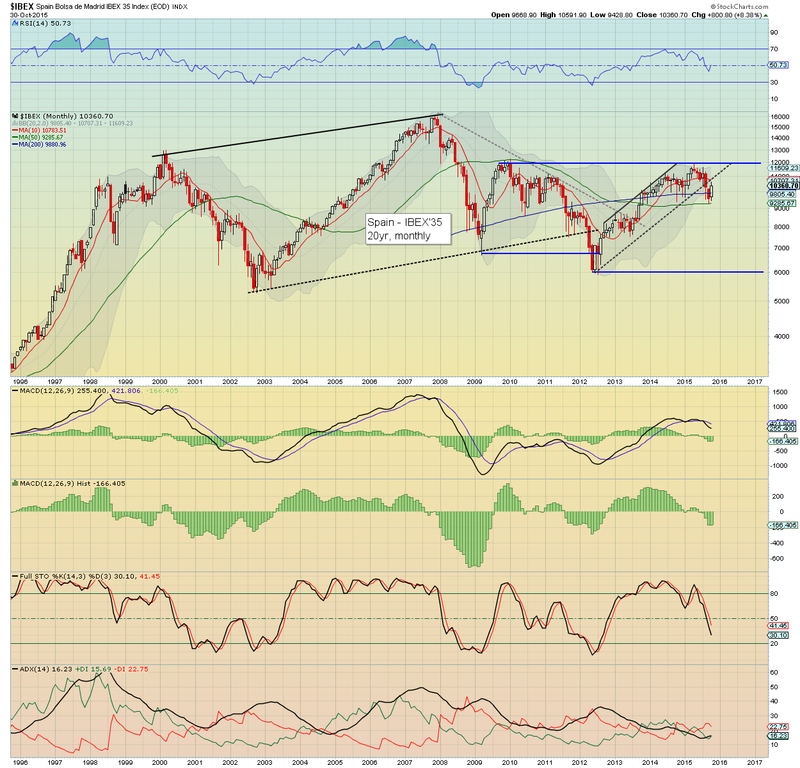 The Russian equity market managed the first monthly gain since April, of 7.1% @ 842. Next resistance thresholds are 1000 and then 1200. With energy prices likely to remain weak into 2016, the Russian market will find it difficult to sustainably break >1K before late spring 2016. 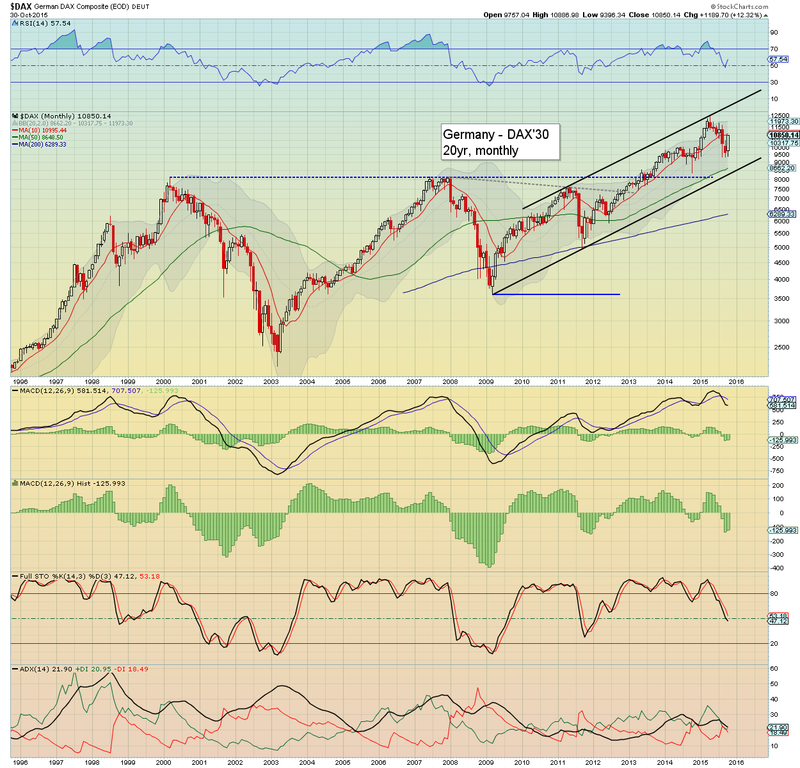 The multi-month decline has come to an end, with a net monthly gain for the Shanghai comp' of 10.8%, settling @ 3382. 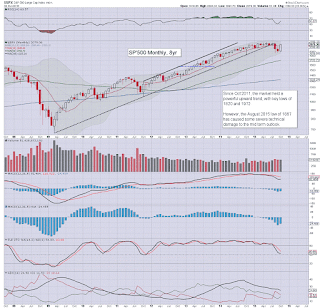 The monthly 10MA (3690) will be important to break/hold over... by year end. 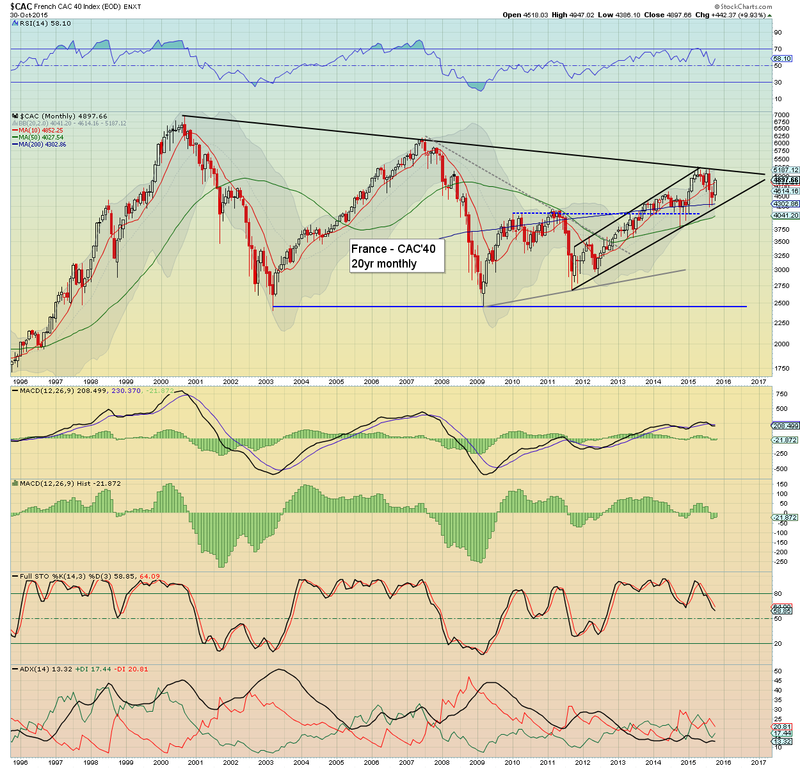 On any monthly close >3800/900, first upside target will be 5K, with an equally valid target of the historic high of 6124.. by end 2016. Without question, it was a monstrously bullish month for world equities, powering up and away from the lows of late August. The US and German markets remain strongest, whilst the commodity dependent nations - such as Brazil/Russia, continue to struggle. 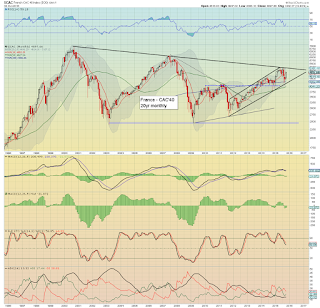 Broadly... world equities look set for a moderate retrace of around 3-4% into mid November.. and then broadly climb into spring 2016. *there are a considerable number of scheduled appearances from various fed officials.. but nothing from Yellen. 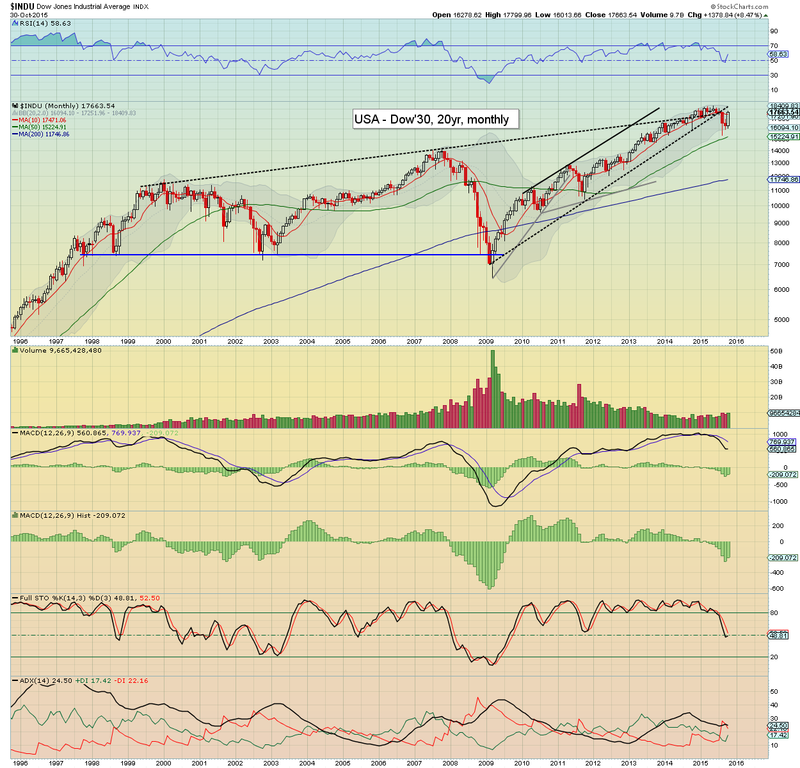 October saw US equity indexes power relentlessly higher, with the sp'500 +159pts (8.3%) @ 2079. 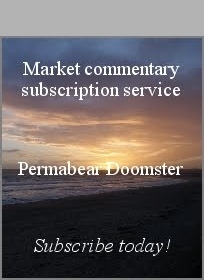 The Dow +1378pts (8.5%) @ 17663, whilst the Nasdaq +433pts (9.4%) @ 5053. 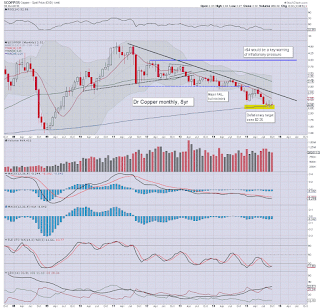 WTIC oil ended the month +2.8% @ $46.59, whilst Copper settled -1.0% @ $2.32. A key closing back above the 10MA... very decisive.. and ongoing price action bodes for new historic highs (>2134) before year end. 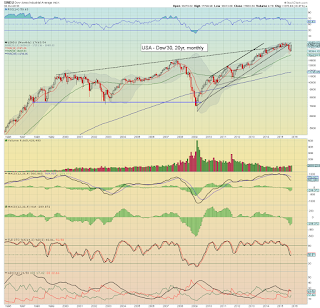 A close above the monthly 10MA... already within a mere 3% or so from breaking new historic highs. 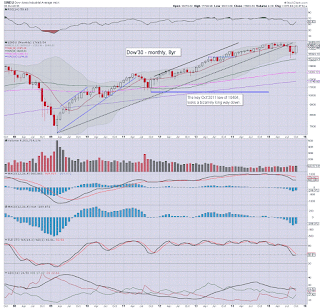 The third consecutive blue candle... having again got stuck at the 10MA. 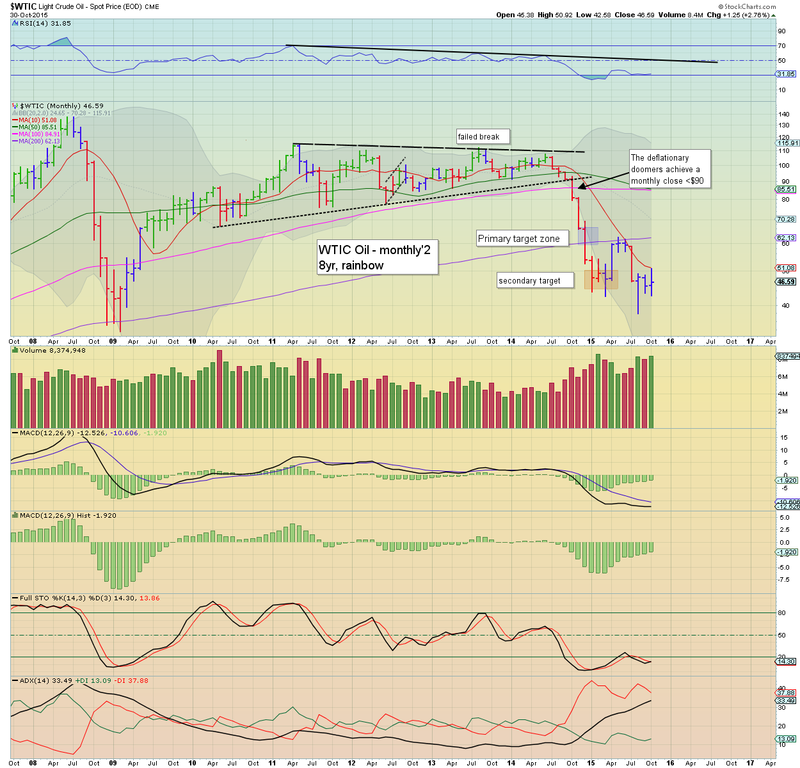 With supply being an unresolved issue, Oil prices look vulnerable for the remainder of the year. Another month of moderate churn in the low $2s. 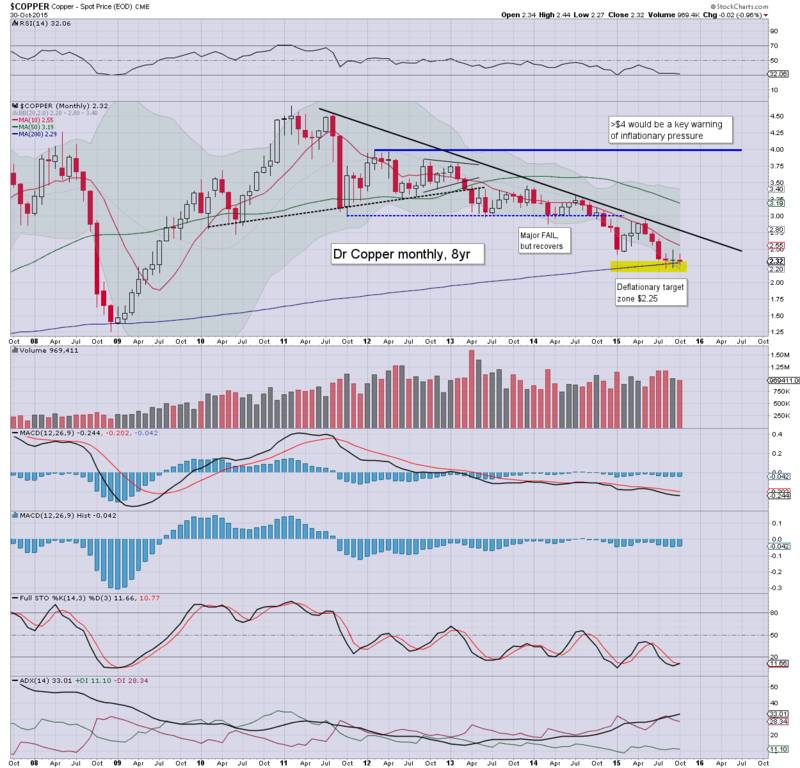 Along with most other commodities, Copper will be vulnerable to renewed strength in the USD... sub $2 remains a very valid scenario into 2016. 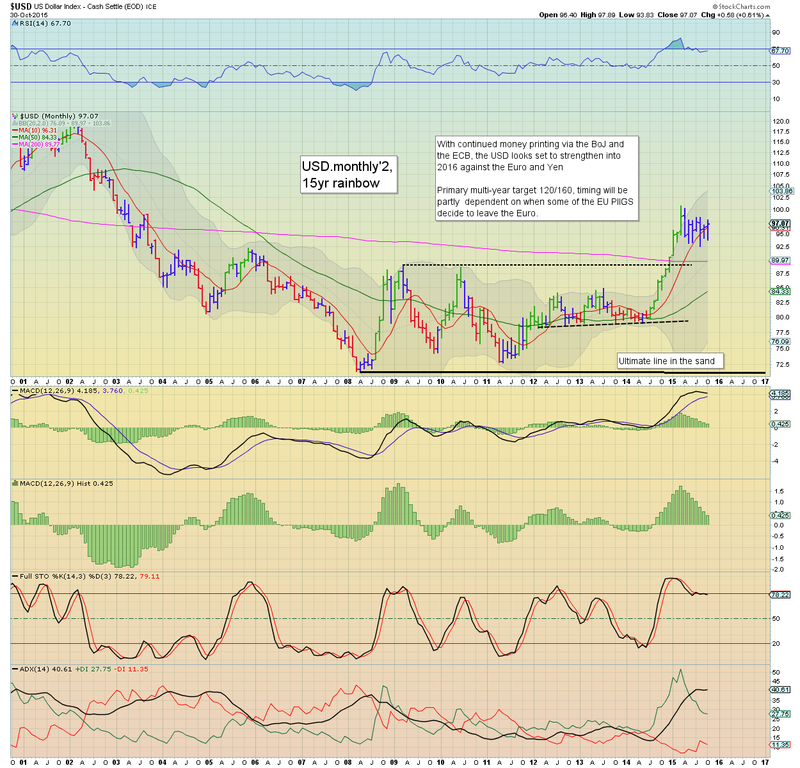 A net monthly gain of 0.6% @ DXY 97.07. Price structure remains a giant bull flag. Underlying MACD (green bar histogram) cycle will be vulnerable to a bearish cross in Dec/Jan'2016. 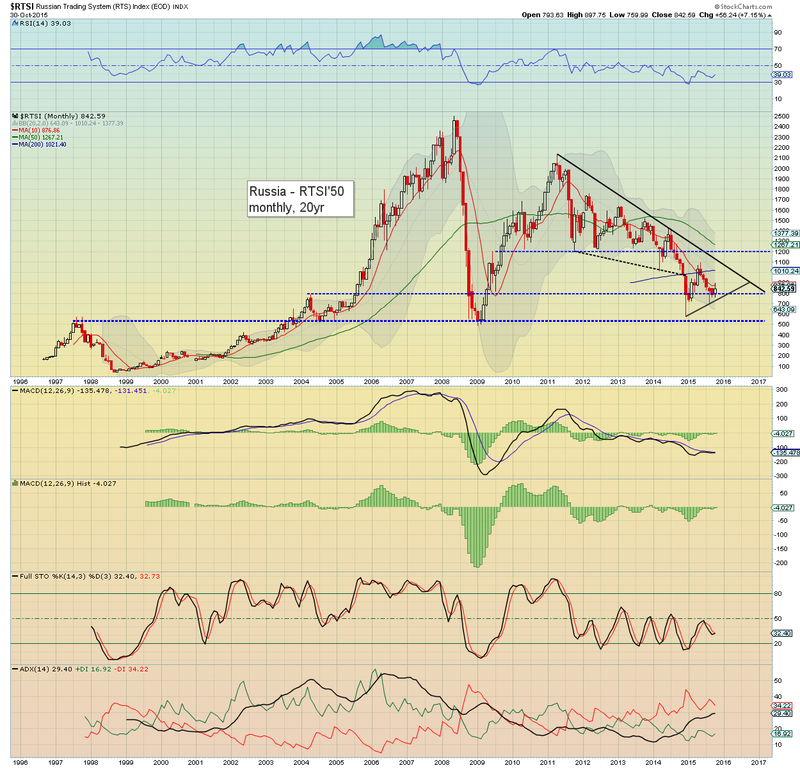 A break above the DXY 100 threshold still looks due - as the BoJ and ECB continue to print, along with the grander issue of increasing capital flows into the USA. October was a crazy month indeed. I had expected a move to eventually test the 10MA... and had hoped for a critical fail.. but no. 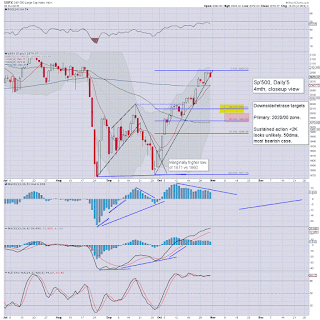 The equity bull maniacs have re-taken control, and look set to battle to new highs.. probably into late spring 2016. 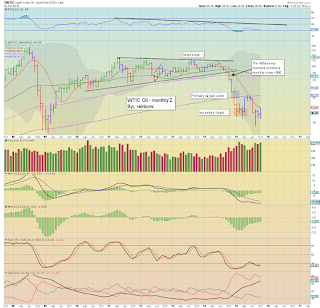 US equities ended the month moderately lower, sp -10pts @ 2079 (intra high 2094). The two leaders - Trans/R2K, settled lower by -0.1% and -0.3% respectively. 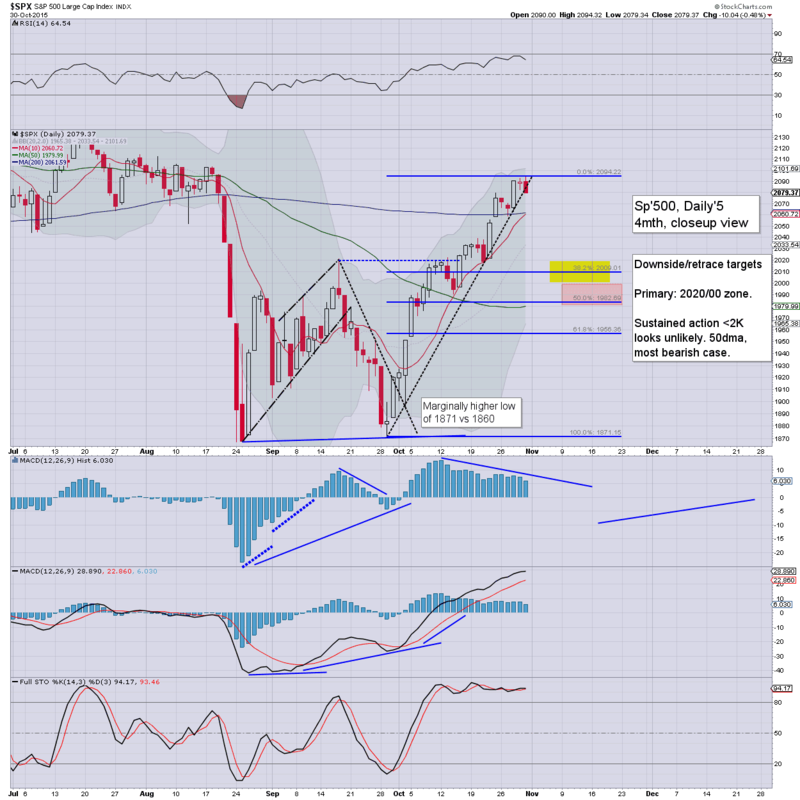 Near term outlook is for a natural retrace to the sp'2020/00 zone.. where there are multiple aspects of support. 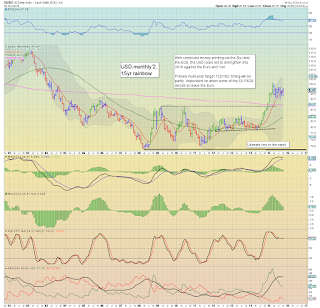 From there... broadly higher into year end. Suffice to add... at the current rate, the daily MACD (blue bar histogram) cycle will see a bearish cross next Tue/Wednesday. 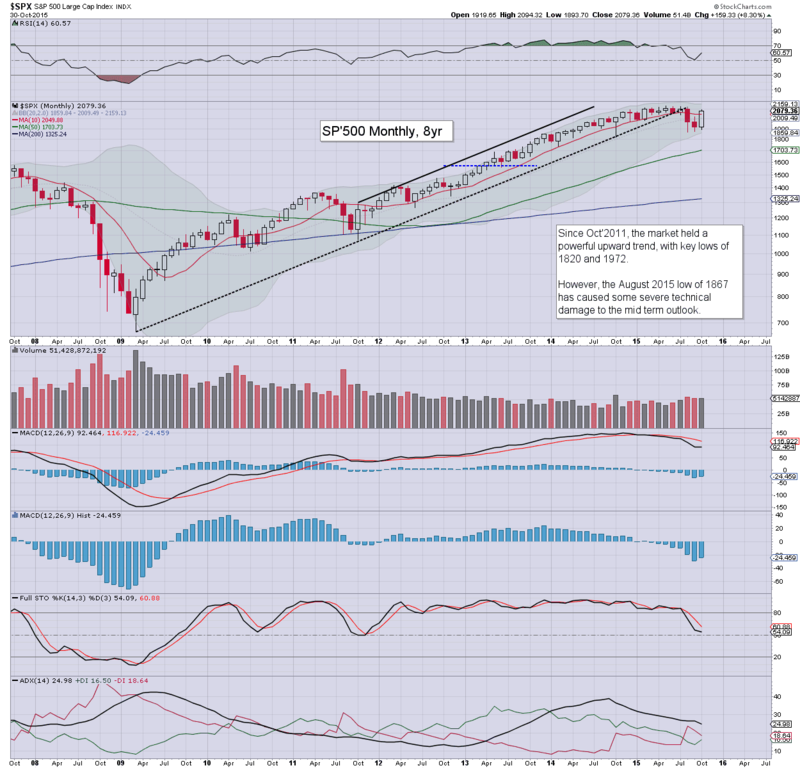 Sustained action - even given 2-3 weeks, under the sp'2000 threshold looks unlikely for the remainder of the year. 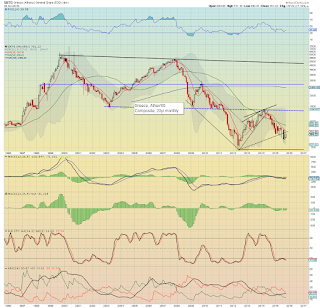 At best.. a retrace to the 2020/00 zone before renewed upside.